It’s true. Our Council members wield significant power and influence. Revenue targets, profit margins, important company policies - they make decisions in all of those areas and more. 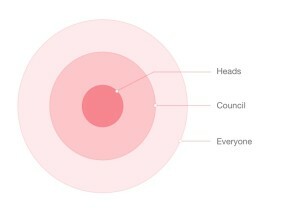 The average age of our current council members? 26. The youngest member on our current council? He’s just 24. Do they have business degrees from top universities? Far from it. They’re programmers, product managers and business analysts. How did they get the job, you ask? They got elected. Democratically. There’s a fixed number of council seats. There’s a nomination and voting process - not very different from how you’d expect a democratic system to function. The eligibility criteria to get nominated? 6 months of experience at Multunus. That’s it. Nothing more, nothing less. If you’re rolling your eyes in disbelief, read on. There’s a method to the madness. So let’s start from the last question and work upwards from there. What type of business are we in? What does success mean for us? We’re in the software services business. We build software products for our customers, augment their existing tech teams and also provide technology and design consulting services. What type of culture will ensure the most amount of success for our business? Needless to say, our culture needs to be be aligned with and support our vision well. If everyone is to be a CxO, a key attribute that we’d need to consider would be Autonomy. NOTE: Autonomy is * not* Empowerment. If we’re drawing the boundaries of a playground and inserting our team members as players with those constraints in place, that’s empowerment. Its when we remove those constraints, look away and trust our team to do the right thing, that we become truly autonomous. The next logical question then is this: What functions of our business need to be autonomous? Just those parts that are most relevant to the day to day work of each team member? Or all other functions of the company as well? For example should we include Finance, Marketing, Operations and Sales, as well under everyone’s purview? If we applied logical reasoning here, we’d probably come to the conclusion that these are functions that require deep experience in their own right, to make critical decisions. And it’s best to leave it to the “professionals”. While that’s a reasonable conclusion for most companies, it’s not aligned with our vision of everyone playing the role of a CxO. For us to make that vision a reality, we need to provide as many avenues as possible for our team to engage in our business. No holds barred. But how do we make that happen? How can we have people with little or no experience in these functions make important decisions, without compromising the sustainability of our business? What kind of organization structure makes the most amount of sense for us? A hierarchical one? Or a flat one? Those are the two obvious choices available these days. A strictwith its command and control style of functioning - leaves almost no room for experimentation and failure, thereby leading to little engagement in the business as well. Aat the other end of the spectrum seems, on the surface, like an ideal solution for creating an autonomous workplace. But this doesn't work well in practice. A lack of rules or guidelines combined with little or no delineation of responsibilities could result in risking business sustainability. Heads: This is the founders of the company along with the Business Unit heads. These folks have the most amount of business experience - and act as mentors for the Council. Council: The council members are democratically nominated and elected - through a company-wide transparent process. Anyone who has worked at Multunus for 6 months or more is eligible to be nominated. The election process happens twice a year - and new members are elected into the council each time. Everyone:The rest of the team. Any decisions that need everyone to be involved (beyond the Heads and the Council) are discussed on Trello - on our “Open Board”. The “formula” for rolling out our 20% investment time. The council then worked with each of our teams to help them negotiate with customers to accelerate the switch to the new system. A simple framework was then created to help determine the best option that we could go with - that would allow for us to roll out the investment time without pushing us into the red. Billing Rates: Our current rate card is the output of a collaborative exercise between the Heads, the Council members and everyone else on our team. This allows everyone on our team to both have a say in terms of what expectations we want to set with our customers, while also being responsible for meeting (ideally exceeding) those expectations. Those are some discreet examples of important decisions made by the council. But here’s a magical moment that happened a couple of weeks after we rolled out the council system: One of our newest employees (a fresh grad barely out of our on-boarding program) had an open debate with the founder (yours truly) in a public forum. I later commended him on the courage he’d shown in openly voicing his thoughts. I couldn’t have said it better, myself. That, in a nutshell, is engagement in the business. Because of the lack of relevant experience in the Council members, there is a need for documenting standards and processes for key decisions to be made in a consistent way. This documentation requires significant effort. We tried to bypass this once: let’s just say, that didn’t go too well. The Heads need to walk a tightrope while providing inputs to the council. While these inputs should help the Council make consistent decisions, any additional interference from the Heads could significantly compromise the autonomy of the council. This has to be mindfully practiced. A lack of enough delineation of responsibilities among the Council members themselves. This sometimes leads to indecisiveness. We’re still working on finding a solution to this problem. Relinquishing control is a scary proposition for most founders and executives. But if done carefully, it's worth it. We’ve been pleasantly surprised by the maturity of decisions that our Council has taken so far. There is one potential issue though. Of the original founders of the company getting lost in a sea of many other founders and CxO’s.